Who cares if you drink your whites too cold, can’t taste the peach in a Viognier, or didn’t know that Meritage is actually supposed to rhyme with heritage? Wine can be a fascinating journey, but it doesn’t always have to be an epic quest. Sometimes, it can just be a rollicking bump in the road. Don’t forget: were it not for Boone’s Farm Tickle Pink, many wine snobs wouldn’t be drinking Provençal rosé today. February has two great chances to have some fun with local wine: Valentine’s Day, and the long Presidents’ Day weekend, which is perfect for a quick wine getaway. Instead of the typical flutes of French sparkling for Valentine’s Day, how about something a little different? Most local wineries are happy to ship. The new Effingham Manor Winery in Nokesville has a beautiful rosé sparkling wine made from Pinot Noir grapes. In Leesburg, Casanel Vineyards offers a bubbly called Red Spark, made with estate grown Norton, Virginia’s native grape. And Paradise Springs in Clifton sells a fun Pineapple Sparkling, made in the style of Champagne, from Maui pineapples. Traditionalists will appreciate the Blanc de Blancs from Greenhill Vineyards in Middleburg. How about an apple wine for the apple of your eye? (Just don’t write that on the card.) North Gate Vineyards in Purcellville and Chateau O’Brien in Markham both have excellent apples wines. In Delaplane, one of our favorite hidden gems, Arterra Wines, has a Blueberry Apple Wine, and Village Winery in Waterford mixes apples with elderberry, along with several non-alcoholic elderberry-based beverages. 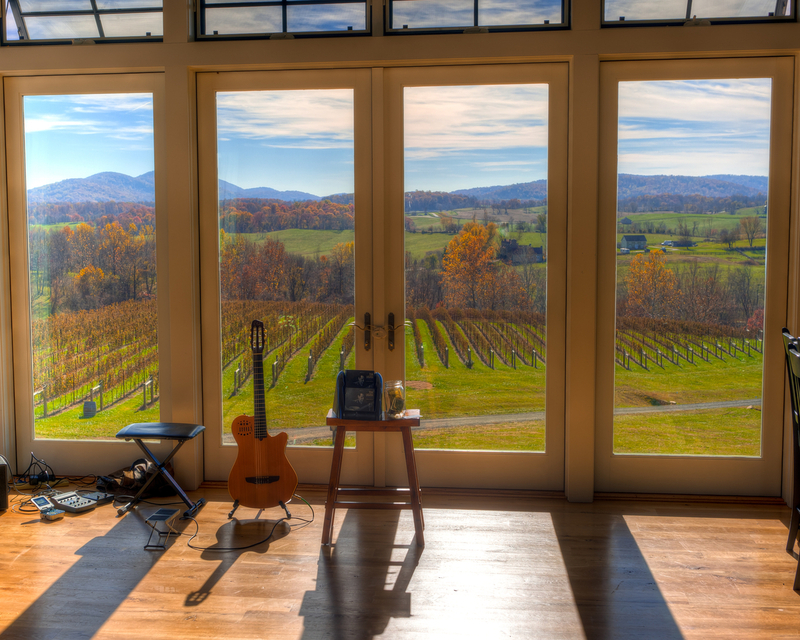 This weekend’s musician is taking a break between sets (in the tasting room at Delaplane Cellars — HDR image). Serious wine drinkers may leave the room in dismay if you uncork a chocolate wine, but that’s fine; more for everybody else! Barrel Oak Winery in Delaplane sells the popular Chocolate Lab, a Port-style wine of Chambourcin grapes infused with cracked cocoa nibs and aged in oak and whiskey barrels. And for a little cherry to go along with the chocolate, Hiddencroft Vineyards in Lovettsville has a sweet 100% Montmorency cherry wine. Hiddencroft is known for very good serious (aka dry) wines, but also crafts some of the best fruit wines in the region, including two blueberry wines, Grandpa’s Fantasy port-style and Grandma’s Love Potion Blueberry Wine. Maybe the most romantic Valentine’s gift would be the gift of a long weekend away from the cold, the crazy political climate, or whatever else ails you. Plan ahead for a Presidents’ Day getaway. L’Auberge Provencale is a short drive to anything: shopping in Middleburg, hiking at Sky Meadows State Park, the scenery of Skyline Drive, but maybe most importantly, the inn is within 30 miles of two dozen wineries, most in the Delaplane area. There’s no particular strategy needed for a visit to wineries around Delaplane; throw a dart at a map and you’ll hit one worthy of a visit. Reserve a tour and tasting at RdV Vineyards, a premier winery that does not take walk-ins. Delaplane Cellars has excellent reds and dramatic views from its floor-to-ceiling windows. Chateau O’Brien offers several different tastings, including a private cellar tasting of reserve wines, and tasty hot sandwiches and grilled flatbreads to enjoy on a large covered deck. In nearby Hume, Philip Carter Winery has interesting artifacts displayed that tell of the Carter family’s 250-year history of making wine in Virginia. 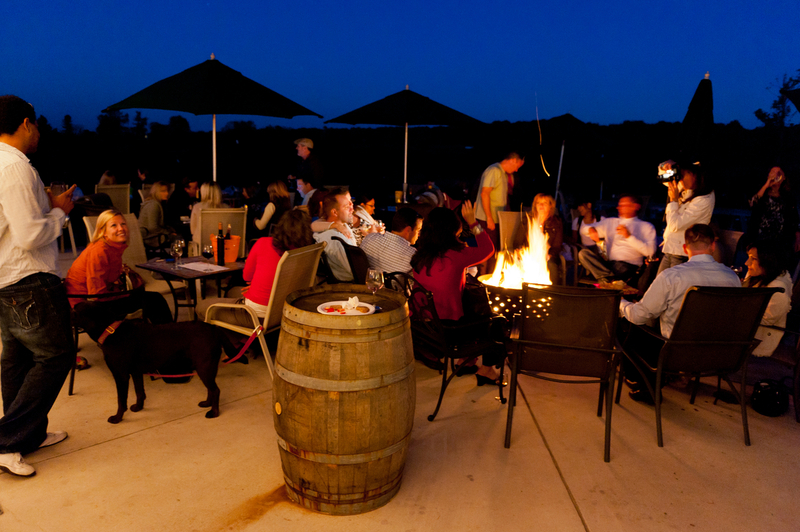 Happy visitors enjoy their wine and the firepits distributed around the patio at Barrel Oak Winery (just after sunset during the annual harvest party). Or, for a more whimsical getaway, head to Barrel Oak Winery for Giant Jenga on Friday night, and then back to Barrel Oak to celebrate National Drink Wine Day on Sunday for a relaxed morning breakfast of bagel and cream cheese with a newspaper (complimentary). Pair breakfast with Barrel Oak’s Mimosas (OJ and Sparkling Wine) or Poinsettias (Cranberry Juice and Sparkling Wine). Live music starts at 1:00.